Tonight was much more alive than last year in Clarendon. The excellent weather combined with Halloween falling on a Friday night brought droves of costumed party goers. It really was a fun and energetic night! Clarendon Ballroom was the place to be, as the line seemed endless (about three blocks). Even though it was impossible for everyone waiting to get in, the Ballroom's line transformed Wilson Blvd into the place to show off your costume or ogle other people's get ups. Both Clarendon Grill and Mister Day's also were packed and popular, as to be expected. There were plenty of creative costumes, such as rubik cubes, human tetris players, and even a guy dressed as "the shocker". If you don't know what that is, please don't google it at work. Broken Social Scene received a warm welcome on a cold night to the State Theatre in Falls Church. 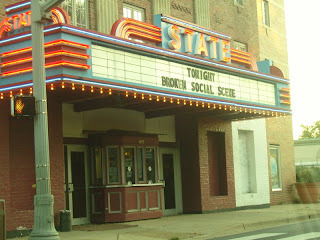 The sold out show had fans waiting in line around the block for seats in the art deco venue. Land Of Talk woke the crowd up with some energetic, if unrefined, indie rock lead by frontwoman Liz Powell. Liz also provided the female vocals for BSS tonight as Amy Millan from Stars fame was not present. The indie supergroup Broken Social Scene did not disappoint anyone, playing some of their popular songs as well as a hour long encore. And they brought cake for the audience! Well only a small cake enough for a few in the first row to dig their hands into, but still a cool gesture. I have to mention Andrew Whiteman's and Charles Spearin's performance skit of impersonating his neighbor lady's voice with a sax, simply incredible and hilarioius. 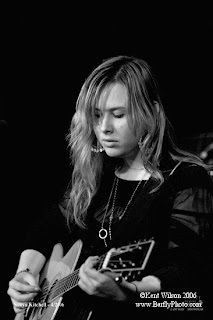 Sonya Kitchell's soothing indie folk melodies came to Iota on Saturday night. I missed The Slip, who is on tour with her across the country, opening up for her band. I like Sonya's vocals on "For Every Drop", which has a little alternative flair to the melody. I like that song much more than her most popular beat "Let Me Go". Her other songs are more folkish, and lead to a relatively quiet night in the venue. The 80's tribute band The Reflex was also back at Clarendon Grill tonight for some retro fun.